Alan Bates, Michael Caine, Sean Connery, Tom Courtenay, Albert Finney, Richard Harris, Peter O'Toole, Robert Shaw and Terence Stamp: They are the most formidable acting generation ever to tread the boards or stare into a camera, whose anti-establishment attitude changed the cultural landscape of Britain. This was a new breed, many culled from the working class industrial towns of Britain, and nothing like them has been seen before or since. Their raw earthy brilliance brought realism to a whole range of groundbreaking theatre from John Osborne's Look Back in Anger to Joan Littlewood and Harold Pinter and the creation of the National Theatre. And they ripped apart the staid, middle-class British film industry with kitchen-sink classics like Saturday Night and Sunday Morning, This Sporting Life, The Loneliness of the Long Distance Runner, A Kind of Loving and Billy Liar before turning their sights on international stardom: Connery with James Bond, O'Toole as Lawrence of Arabia, Finney with Tom Jones and Caine in Zulu. 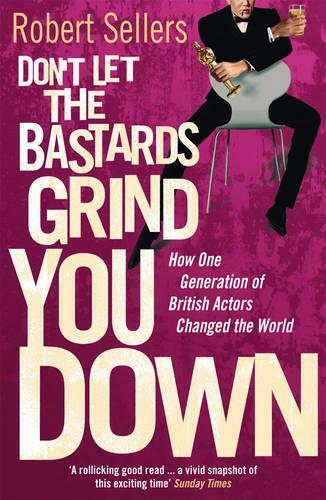 Don't Let the Bastards Grind You Down brings alive the trail-blazing period of theatre and film from 1956-1964 through the vibrant energy and exploits of this revolutionary generation of stars who bulldozed over austerity Britain and paved the way for the swinging 60s. What Peter Biskind's Easy Riders Raging Bulls did for American cinema writing so Don't Let the Bastards will do for the British cinema.